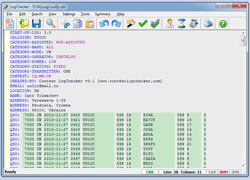 Contest LogChecker is a set of contest tools for Microsoft Windows, combining advanced text editing with keyword highlighted, and the ease and flexibility of import, export, statistics and charting utilities. With LogChecker you can edit, fill in the log, check Cabrillo Format and Header, convert files from the most popular logging software to Cabrillo, print customizable files, calculate statistics and export logs to RTF, PDF or HTML for publishing. Check Cabrillo Log Format, including line length, white spaces position, mode, frequency, date and time value. Check QSO Entries, including duplications check, Master Callsign Database, FCC Database and Callbooks (BuckMaster HamCall, QRZ, RAC, and Eurocall) maintenance. Create and Edit the entire Cabrillo Header (version 3.0). Convert logs to ADIF, Cabrillo, and Excel CSV format. Fill in the log directly to Cabrillo format (from paper log). Import from different HAM-radio log program formats (ADIF, CT, EDI, TRLOG, STF, ADX etc.). Calculate Statistics for the most popular contests and save all the data to a file. Create Contest Chart for QSO, Points and Multipliers separately and save the chart picture to a file. Special Export to RTF, PDF and HTML for publishing. Use a powerful, highly customizable, and easy to use editing environment. Create smart dynamic bookmarks using hot keys or menu items. Cut, Copy, Paste, Insert, Delete, Find, Replace, and multilevel Undo/Redo. Change Line Endings (UNIX, Windows, and Mac formats). High quality printing logs with customized fonts and colors. 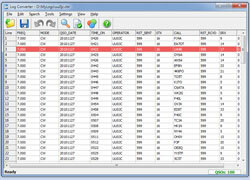 LogChecker can be used to convert various Amateur Radio log files to Cabrillo format and to convert Cabrillo log files to ADIF format. LogChecker currently supports the following file formats: ADIF, CT v8, v9, v10, STF, TR Log, EDI, ARRL, MixW, ADX, MDB, DBF, Excel (.xls), any comma and TAB or white spaces delimited files. 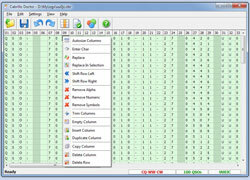 LogChecker can be used to calculate statistics for the most popular Contests. LogChecker allows for the creation of a Contest Chart for QSO, Points and Multipliers separately and save the chart picture to a file. See what's new in LogChecker version 4.7 here and all supported contests here.